The drone economy is booming abroad and an underground version is growing fast in the U.S. The FAA plans to draw up regulations by 2015, but that’s not quick enough, according to drone entrepreneurs. SAN FRANCISCO — Amazon.com CEO Jeff Bezos says in the future drones delivering packages will be as common as mail trucks. But for many entrepreneurs, the drone economy is already here. Real estate specialist Manie Kohn uses drones to video luxury properties. Terence Reis flies them to photograph surfers. Brad Mathson monitors farmland in the Dakotas, while Ryan Kunde uses a drone to improve production at his vineyard. Bezos thrust drones into the spotlight when he talked about his plans to use them to deliver packages on 60 Minutes Sunday night. But thanks to drones’ ability to shoot aerial photos and video steadily and collect other data cheaply, they are already being used in many sectors, including movie making, sports, mining, oil and gas production and construction. Most of the activity is outside the U.S. because of regulatory uncertainty. But there are a lot of U.S. drone operators who are either hobbyists, or who provide drone services for free or in return for donations. Business owners can also operate their own drones for their own benefit. And at times, money changes hands out of the FAA’s gaze. Once the FAA drafts its drone regulations, integrating the devices into U.S. airspace could boost the economy by at least $13.6 billion in the first three years and the economic benefit may top $82 billion between 2015 and 2025, the AUVSI estimated earlier this year. It could also create more than 70,000 new jobs, including 34,000 manufacturing positions, in the first three years, the group forecast. In 10 years, it projects 100,000 jobs will be added. Egan says those numbers don’t account for the impact of future regulation, focused on safety and privacy, which could increase the cost of operating drones and reduce the value of the technology. Despite such uncertainty, the commercial potential of drones has attracted big investors. Airware, which makes software and systems that control drones, raised more than $10 million this year from Andreessen Horowitz, a big venture capital firm, and Google’s venture capital arm. But a lot of the action involves individual entrepreneurs and small business owners who are using this new technology to either make more money from existing operations or branch out into new areas. 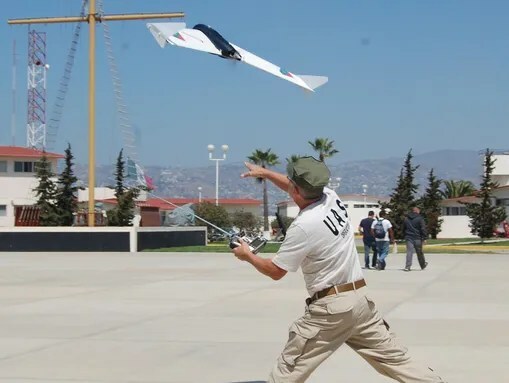 Drones have mostly been used by the U.S. military to shoot missiles at enemy combatants in countries such as Afghanistan and Pakistan. However, the cost of these unmanned aircraft has dropped precipitously in recent years, making them more affordable. 3D Robotics, a drone manufacturer run by former Wired magazine editor-in-chief Chris Anderson has already sold “tens of thousands” of drones and the company will soon launch a new model called IRIS, aimed at consumers and other individuals, that will cost about $750. Drones cost millions of dollars just a few years ago, partly because the components needed to control them, such as global positioning systems, gyroscopes and accelerometers, were so expensive, according to Anderson. The boom in smartphones, which contain most of the same hardware, has increased production massively, lowering costs. 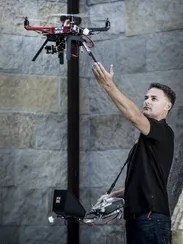 Manie Kohn, who works in the high-end real estate market of the San Francisco Bay Area, got his hands on drones for the first time about three years ago. He used to use helicopters to shoot aerial photos and video of luxury properties for real estate agents who were willing to pay $20,000 for an extra service that could help win big commissions. But helicopters were expensive, noisy and limited in how low they could fly. 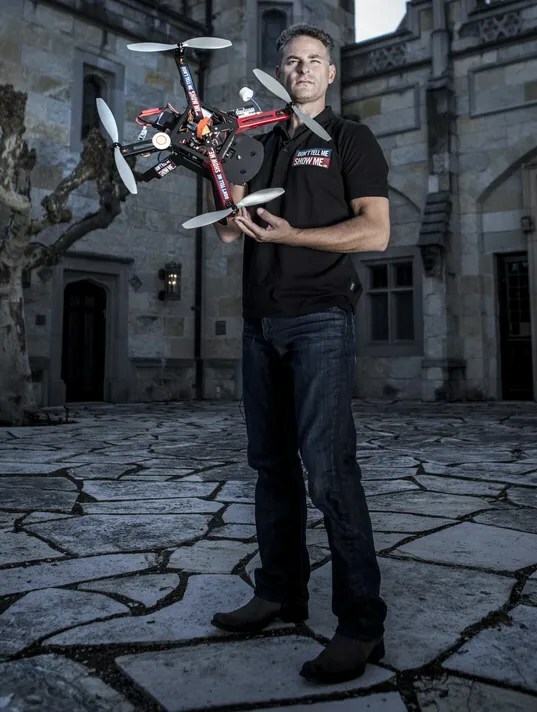 So Kohn started building his own drones to do the job and has spent at least $45,000 developing the machines, getting trained to fly them, accumulating certifications and lining up insurance. It took Kohn about a year to track down an insurer that would cover his drone operation. Transport Risk Management now provides him with coverage that starts at $1 million and covers damage to property, people and the drones themselves. The cost of the policy depends on proficiency, so Kohn had to get official training and certification. “There is an ever growing demand for this type of coverage,” Dawnell West, an insurance agent at Transport Risk Management, wrote in a recent e-mail to Kohn. 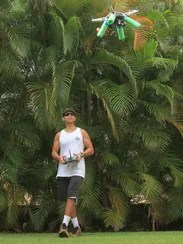 Terence Reis, a 54-year-old IT professional based in Oahu, started using a drone this year for his part-time business, KahiwaKiwi Media Productions, which shoots surfing photos and takes other photos and video of Hawaii ocean life. Reis spent about $5,000 on parts and equipment. But it has helped him take better pictures and video from locations that he couldn’t have reached before. “Before, I would shoot from a helicopter, which was very expensive — about $300 to $400 an hour,” he says. Helicopters also could not get low enough and they vibrated a lot, which meant the images had to be edited heavily. Reis’s drone is steadier, which sometimes means no editing is needed. The biggest opportunities, at least initially, may be in agriculture, because big farms do not have many people on them, reducing the risk that wayward drones might cause injuries if and when they crash. Dakota Precision Ag Center is using drones that cost about $3,000 to collect agricultural data that helps farmers produce more by monitoring crops and cattle and guiding watering and fertilizer application. Using traditional methods, about 100 to 300 acres of farmland can be monitored a day, but using drones that number can rise to 2,000 or 3,000 acres a day, according to Brad Mathson, assistant director of the Dakota Precision Ag Center. Ryan Kunde of DRNK Wines uses a drone to keep an eye on how grapevines are growing in his vineyard in Sonoma, Calif.
Kunde flies the drone over the vineyard, takes photos and uses software to stitch together a map of the area. By comparing maps at the same time of the season each year, he can spot which grapes are developing quickest, which helps to decide where to harvest first. The same drone images help with estimating crop sizes, giving Kunde more time to line up the right number of grape buyers. 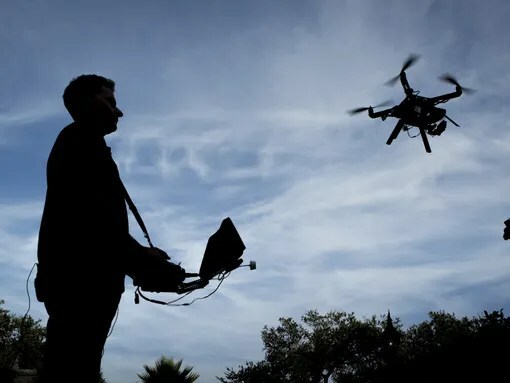 The Motion Picture Association of America has been lobbying the Obama administration to let filmmakers use drones, arguing that putting a camera on an unmanned aircraft can be cheaper, safer and more useful than relying on a helicopter or a crane to get a difficult shot. The effort has not borne fruit. But drones are already being used in making movies, TV shows and advertisements, according to Gus Calderone of IsisCopter LLC, which makes drones and related equipment. Drones with rigs costing $25,000 carry cameras in Hollywood that weight about 15 pounds and are worth $30,000 to $40,000, he explains. Gene Robinson runs his search and rescue service through a non-profit called RP Search Services, which uses drones with high-resolution cameras and infrared sensors to track down missing people and help authorities obtain access more safely to dangerous areas. The FAA said in 2007 that drones, or Unmanned Aircraft Systems, cannot be flown commercially. And so much of the world’s commercial drone activity is happening outside the U.S. The regulator aims to have regulations in place by 2015, and an FAA spokeswoman says it plans to propose a rule for small drones next year. It is also expected to pick six test sites by the end of this year. The FAA is likely to come out with tiered regulations, according to Chris Anderson of 3D Robotics. Small drones may be regulated lightly, while heavier, faster drones that fly higher may face much stricter rules. Drone flights in very lightly populated areas will probably get cleared earlier than activity in urban areas, he predicts. Still, some commercial drone experts worry that the FAA is taking too long, giving a valuable head start to other countries such as Japan, Canada, the U.K., France and Australia. In France, Delta Drone has been training drone operators in its own school for about a year. The course takes roughly a week and then another three days to learn techniques for specific industries. Once trained, Delta Drone signs service contracts with companies, mostly in the mining industry currently, then brings the operators in as sub-contractors. So far, 69 drone pilots have graduated and 80 should be trained by the end of 2013. “It’s growing very fast,” Delta Drone co-founder Fabien Blanc-Paques said.